As the most effective tooth replacement option currently available, dental implants have a remarkably high success rate — over 98%, in fact. But if you feel like your implant is growing loose or uncomfortable, it could be a sign that it’s failing. Don’t hesitate to get in touch with your dentist in Canton, Dr. J.D. Robison, if that happens to you. It’s possible that he can rescue your dental implant and help you avoid the need for retreatment. People who are eligible for dental implants are those who are in stable health and are strong enough to heal after an invasive procedure. Having a healthy immune system is key for implant success, as the bone needs to grow together with the dental implant to provide security for the new prosthetic tooth that will be affixed on top. Even initially successful dental implants can become loose or uncomfortable due to a condition we call peri-implantitis, an infection that develops around the implant. Peri-implantitis is usually the result of poor dental hygiene after implantation, but the infection can also develop during the implant surgery. Peri-implantitis results in bone loss and usually requires the replacement of the dental implant. If you notice your dental implant becoming loose or uncomfortable, don’t wait to get in touch with your dentist. 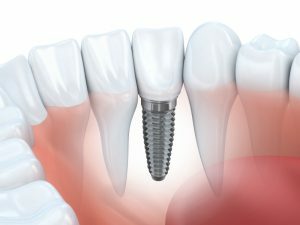 It probably won’t get better on its own, and prompt attention may prevent the need for replacing the dental implant. Even if the looseness is not indicative of a problem, your dentist still needs to know what’s going on with your dental implants. Here are some things to keep in mind if you have a loose dental implant. Maintaining proper dental hygiene following your dental implant placement is important for preventing bacteria buildup and promoting better oral health over a lifetime. Make sure you are brushing your teeth for two minutes, at least twice a day, and flossing daily. Use an interdental cleaner or water pick for additional help removing plaque and bacteria from around your dental implant. You should also be aware that tobacco use greatly affects the success of dental implants. People who smoke are unlikely to heal properly following dental implant surgery. Quit smoking before receiving dental implants, and do not pick up the habit once you have had your missing teeth replaced. Have you noticed discomfort or loosening of one of your dental implants? If so, don’t hesitate to get in touch with your implant dentist, Dr. J.D. Robison — your smile depends on it! Request an appointment right away.